کیسی کیزم (اینگیلیسجه: Casey Kasem) آمریکالی دوبلور و اوْیونچو. ۲۷ آوریل ۱۹۳۲ ایلینده میشیقان ایالتینده دۆنیایا گؤز آچیب. ۸۲ ایل عؤمر ائله‌ییب و ۱۵ ژوئن ۲۰۱۴ میلادی تاریخینده وفات ائدیب. 1954–2010 ایللر آراسیندا سینما ساحه‌سینده چالیشیب. 1970 Skyhawks Steve Wilson, Joe Conway (voice) Episode: "Devlin's Dilemma"
1972 Wait Till Your Father Gets Home George (Voice) Episode: "The Neighbors"
1977 Police Story Sobhe (Live-action) Episode: "Trial Board"
1977 Quincy, M.E. Sy Wallace (voice) Episode: "An Unfriendly Radiance"
1977 Switch Tony Brock (Live-action) Episode: "Fade Out"
1978 Charlie's Angels Tom Rogers (Live-action) Episode: "Winning Is for Losers"
1983 Matt Houston Master of Ceremonies Episode: "Target: Miss World"
1989, 1991 Saved by the Bell Himself Episodes: "Dancing to the Max", "Rockumentary"
1991 Beverly Hills, 90210 Mr. Franklin's Friend Episode: "Spring Training"
1992 Tiny Toons Adventures Flakey Flakems (voice) Episode: "Here's Hamton"
1993 2 Stupid Dogs Bill Barker (voice) Episode: "Let's Make a Right Price/One Ton/Far-Out Friday"
1994 Captain Planet and the Planeteers Lexo Starbuck (voice) Episode: "You Bet Your Planet"
1995 Homeboys in Outer Space Spacy Kasem (voice) Episodes: "Loquatia Unplugged or Come Back; Little Cyber"
1996 Sabrina the Teenage Witch Shaggy Rogers (voice) Episode: "Sabrina Unplugged"
1997 Johnny Bravo Shaggy Rogers (voice) Episode: "The Sensitive Male/Bravo Dooby Doo"
2000 Histeria! Calgary Kasem (voice) Episode: "North America"
2003 Blue's Clues Radio (voice) Episode: "Blue's Big Car Trip"
2003 Teamo Supremo DJ Despicable (voice) Episode: "Doin' the Supremo!" 2010−13 Scooby-Doo! Mystery Incorporated Colton Rogers (voice) 5 episodes (after retirement); Kasem's performance as Shaggy's Dad in the series finale was his final روْل in the Scooby-Doo franchise. ↑ ۲٫۰ ۲٫۱ ۲٫۲ ۲٫۳ ۲٫۴ Barnes, Mike (June 15, 2014). "Casey Kasem, 'American Top 40' Icon, Dies at 82". The Hollywood Reporter. ↑ Looking Back at The Dark (1979) (June 15, 2014). یوْخلانیلیبMarch 15, 2015. ↑ ۵٫۰ ۵٫۱ ۵٫۲ Terrace, Vincent (2008). Encyclopedia of Television Shows, 1925 through 2010 (2nd ed.). McFarland. pp. 478, 545, 980, 1467. ISBN 978-0-7864-8641-0. 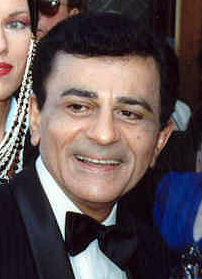 اینگیلیسجه ویکی‌پدیاسی‌نین ایشلدنلری طرفیندن یارانمیش«Casey Kasem»، مقاله‌سیندن گؤتورولوبدور. ( ۲۲ ژانویه ۲۰۱۸ تاریخینده یوْخلانیلیبدیر). قارداش پروژه‌لرده کیسی کیزم گؤره داها آرتیق بیلگی‌لر تاپابیلرسینیز. بۇ صفحه‌‌ سوْن دفعه ‏۱۳ مارس ۲۰۱۹، ‏۱۲:۵۳ تاریخینده دَییشدیریلمیشدیر.